4 minute video on YouTube. Of course this supernatural event will be explained away, as most things are, by the neo-evolutionists. However the butterfly is only one example of how nature is not an evolutionary, mechanistic process, but a supernatural one. 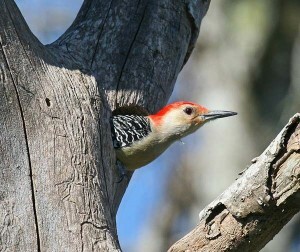 The woodpecker is an amazing bird. Its chisel like bill hammers the wood at an amazing 16 times per second, or 1000 pecks per minute, a rate of fire faster than a machine gun. Normally, banging your head against a tree all day at twice the speed of a bullet, would induce a cosmic sized headache, followed by brain damage. However, there is a special cartilage between the beak and the skull which acts as a shock absorber. Woodpeckers close their eyes when pecking as the velocity would pop its eyes out, and so they only open them between pecks. The European green woodpecker is unique, its tongue is different from any other tongue. Most tongues start at the back of the throat and proceed to the lips. The woodpeckers tongue also starts from the back of its mouth, but then it goes down its throat, round the back of its neck, up over the top of its head, down through a hole between its eyes, then it goes through one of its nostrils and finally it emergence out of its beak. According to Darwin this woodpecker evolved from an ordinary bird, with an ordinary tongue, an ordinary beak, ordinary skull, ordinary habits, ect. Over millions of years it developed a self sharpening chisel of a beak, a pecking speed twice the speed of a bullet, a shock absorbing brain, and a tongue which wraps around its head like a turban, a simple explanation which for some strange reason the sheep like scientific community seem to dutifully nod their heads. And the reason for such amazing evolution? survival? Surely there are easier ways to survive than this. 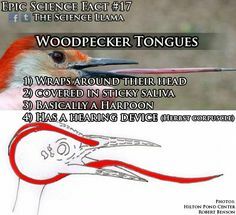 The tongue alone seems a suitable candidate for irreducible complexity, and when you combine this with everything else, the evolutionary explanation for the woodpecker seems yet another example of a Darwinian fairy tale. A five minute video of this can be seen on YouTube. The pistol shrimp roams the waters like an aquatic Clint Eastwood "make my day punk." Its claw can accelerate a jet of water more than 90 m.p.h. Through this brute acceleration the water particles in the immediate vicinity heat up to more than 4000 degrees Celsius (as hot as the sun). This produces a flash of light and a bang which is much louder than a fighter jet. 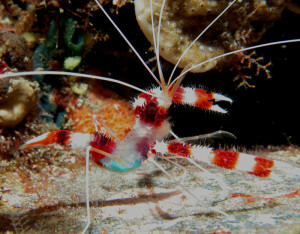 In this way the pistol shrimp stuns its prey and engages in underwater battles. When two of these shrimp meet, its like gunfight at the ok coral "well punk are you feeling lucky?" First they test each other to see who has the bigger firepower and finally they negotiate. Sometimes when its male against female, a truce develops, followed by a large shrimp family. During world war two the US navy suspected the russians of developing new weapons as they could not explain the ear piercing noises in their headsets as they hunted down submarines. The reality however was that two gangs of pistol shrimps were involved in a shoot out. So what happens if an aggressor closes in with a snap and grabs its pistol like claw? Like a scene from the "terminator" another claw immediately develops on its other side. As for a darwinian step by step explanation – best of luck. A 90 second video of this amazing phenomenon can be seen on YouTube. From underwater the archer fish shoots insects with a stream of water, or sometimes it will jump out of the water and spit in their face. The startled victim then falls off its leaf or branch, into the water, and becomes its food. 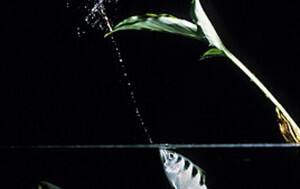 Very rarely does this fish miss, shooting its target from up to a metre below the watery surface. Somehow it takes into account the light refraction as it passes through the water and gravity as the spitball curves towards its victim. How do you go from an un evolved, non spitting fish, to one which can spit from a meter below the surface and "pop" right in the eye of some poor unsuspecting victim chilling out on a branch. Can anyone scientifically explain the step by step mutational process by which this takes place. Of course Darwins fairy tales will very expertly "explain away" these things, whether one believes them however is another thing. Another sharp shooter is two guns the velvet worm, and both can be seen in action on this amazing 3 minute video. There is a species of frog called "Darwins frog" ( probably his next body ) which exhibits an amazing way of bearing its young. The female lays her eggs on the wet beaches. The males pick up their scent and fertilise them. They then station themselves in groups to protect the eggs. When the eggs begin to move in their tiny, jelly like globules, they lean over, stick out their tongues and swallow them. The frogs have actually placed their eggs in a long expanded vocal pouch situated within the lower part of their body. The eggs continue to develop, and then one day, dad lets out a long yawn, and out pops junior, fully developed. Now according to Darwinian evolution, in the past, this ability did not exist, it is something which has evolved. So lets imagine this step by step process. Female lays eggs, male fertilises them, male watches over them. For some reason male deciding to try something different, scoops up egg, somehow knowing there is a pouch within its body to put it in and the frog will survive, and basically swallows it. Many weeks later, frog yawns, out pops kermit and from then onwards this becomes the standard technique for this particular species of frog to bear their young. I am sure many will find these examples very humorous, but iam sure you can also appreciate them as nothing more than Darwinian fairy tales. A twelve second video of this can be seen on YouTube.